You are browsing the Blog for Open Licensing. Aurelia J. Schultz from CC reports on November 30th, 2012: “We are pleased to announce the launch of the Creative Commons 3.0 Uganda licenses. Since joining the Creative Commons family in March of 2011, the Ugandan team has been incredibly busy: hosting the African Regional Meeting, pulling together petitions for the Pan-African Intellectual Property Organization, and spreading the news about CC licenses. While doing all these great activities, they’ve also completed one of the last 3.0 ports. The licenses are available through the license chooser, and like all of our licenses, are intended for use anywhere in the world. The Uganda 3.0 licenses are important as the first 3.0 licenses in Africa and one of the last 3.0 ports before the launch of the new 4.0 licenses. English: The new OER logo is designed to create a common identity for the global OER community of practitioners, projects and researchers. The design creates a common visual idea and allows for the name of the term “OER” to be expressed in different languages.This version is intended to be the main English version. In a recent presentation for GIZ e-learning staff, Balthas Seibold gave an introduction to “Open Approaches to educational provision”, stressing the potential of Open Educational Resources and Open Licensing for Capacity Building. The presentation gives an overview of the changing educational landscape, introduces Open Education and Open Educational Services in practice (openSE, openEd 2.0 (UNU-Merit), ict@innovation (GIZ)) and looks at Open Licensing for Human Capacity Building. The presentation heavily draws on work by Dr. Andreas Meiszner – Senior Researcher & Project Manager at UNU-MERIT, CCG and its of course openly licensed :-). Download as pdf and odt at the publications section (presentations) of this website. 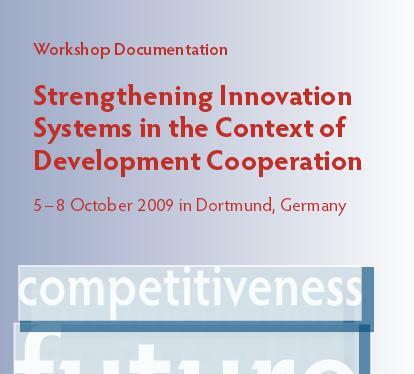 The working group on ‘Promoting Innovation Systems’ of Germany’s development cooperation just published a documentation on “Strengthening Innovation Systems in the Context of Development Cooperation”. An article by Balthas Seibold gives an overview of the potential of open innovation for developing countries. Taking the capacity building programme commons@ip as an example, the paper enumerates important impact indicators, which demonstrate, how a move towards open innovation in developing countries might positively influence innovation systems. 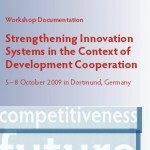 Read the article “Unleashing Open Innovation Systems” in the documentation (page 87 to 92) available as a pdf-download at the publications section of this website. For more information on the InWEnt programme commons@ip, please check the InWEnt Train for Trade Portal.